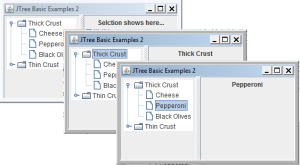 In a previous tutorial we looked at displaying information in a hierarchy using JTree. Now all this is fine but, usually when we use a JTree it is because we want to be able to select an item, one or more. To do this we need to use the event driven notification for the JTree. There are different events for different situations; in our case we are interested in the selection event. When one of the options in the JTree is selected then we want to know about this. First off we build a simple class that creates a JPanel and has a single JLabel field which we will use to display our information. We will also make this class implement the TreeSelectionListener interface so that it is capable of receiving notification of any tree selection events. You can download the source code from http://softwarepulse.co.uk , all we ask is for your email address to send to a link to the download page and to keep you updated on what’s new. You can unsubscribe at any time and we do not share your details with anyone else. Previous PostPrevious The only right way to write code!